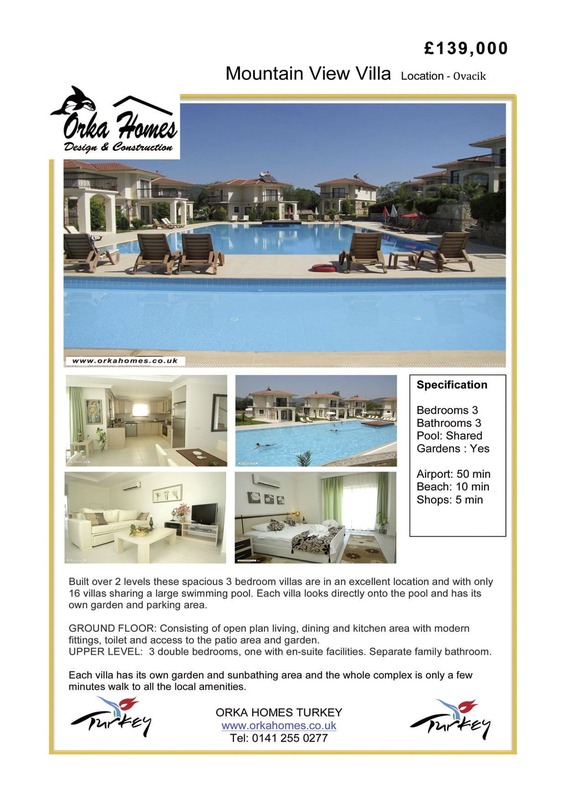 With only 16 villas sharing a large swimming pool this villa in Ovacik for sale is on a development which is perfect for either a holiday home or for residential living, with each villa having its own garden and parking area. Mountain View is located in the centre of the Ovacik valley and only a few minutes walk to the main road where you will find an abundance of shops, restaurants and bars. This villa in Ovacik for sale is built over 2 levels with the open plan ground floor contain the lounge, kitchen and dining area and a separate WC. Upstairs you will find 3 large double bedrooms, the master has an en-suite bathroom and there is a separate family bathroom. Each villas has its own outside sunbathing garden, terrace, patio and parking area and the large swimming pool is of ample size for the 16 villas. This villa is a resale villa and comes fully furnished and ready to move into.